Robert Beatty is the author of the #1 New York Times best-selling Serafina Series published by Disney-Hyperion, a spooky mystery-thriller about a brave and unusual girl who lives secretly in the basement of the grand Biltmore Estate, surrounded by the opulence of the Gilded Age and the rugged beauty of the Blue Ridge Mountains. He won the Southern Book Prize in 2016. He is also the author of the #1 New York Times best-selling Willa of the Wood Series, the story of a young forest girl with ancient magical powers who struggles for survival and understanding in the Great Smoky Mountains. Loved by both young readers and adults alike, the Serafina and Willa books are being taught in over a thousand classrooms nationwide, and have been translated into over 22 languages. Robert Beatty lives in Asheville, North Carolina with his wife and three daughters, who help create and refine his stories. He loves to explore the historic Biltmore Estate and the Blue Ridge Mountains where his novels take place. He writes full-time now, but in his past lives, Beatty was one of the early pioneers of cloud computing, the founder/CEO of Plex Systems, the co-founder of Beatty Robotics, and the chairman/CTO of Narrative Magazine. In 2007, he was named an Entrepreneur of the Year. When asked about the inspiration for his writing, Robert said, “The Serafina and Willa books were inspired by my desire to write about heroic young girls for my three daughters." The first book in the Serafina Series, Serafina and the Black Cloak, was a #1 New York Times best seller, has been on the list for more than 60 weeks, and won the prestigious 2016 Pat Conroy Southern Book Prize. 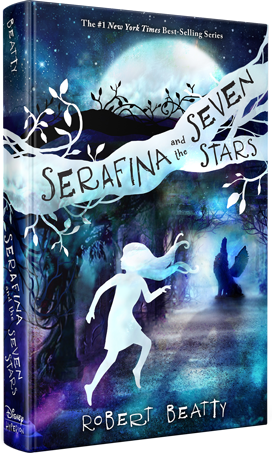 The second book in the series, Serafina and the Twisted Staff, became a #1 New York Times best seller in the first week of its launch and earned a “Starred Review” from Kirkus Reviews, which said, “Even better than its predecessor, a sequel that delivers nonstop thrills from beginning to end.” The third book in the series, Serafina and the Splintered Heart, came out in 2017 to much acclaim. Beatty’s fourth book, Willa of the Wood, published in July 2018, introduced a brand new heroine who quickly became a beloved favorite among many readers. It was #1 New York Times Best Seller and named by Amazon as one of the Best Books of 2018. Kirkus Reviews described it as, "A moving, atmospheric journey of hope." Before he started writing full time, Robert was a successful entrepreneur in the tech world. He was the founder, CEO, and chief architect of Plex Systems, which provides management information systems to automotive, aerospace & defense, and other manufacturing companies throughout the world. As the chief architect of the Plex Manufacturing Cloud, he was one of the pioneers of cloud computing. He’s a patented inventor, and in 2007, he was named an Entrepreneur of the Year. The picture at right shows Robert and his wife, Jennifer, accepting the award. Since then, Robert has been involved with a variety of other tech companies. A few years ago, when his young daughters Camille and Genevieve became interested in electronics, Robert and his daughters started building robots together. As their skills developed, the three of them became the co-founders of Beatty Robotics. Their company builds highly functional replicas of Mars Rovers and other spacecraft for science museums and aerospace companies. Today, their robots are operating in the New York Hall of Science, the Asheville Museum of Science, Malaysia, the Czech Republic, and other locations around the world. Robert and his daughters have become inspiring role models not just for young roboticists and makers, but for parents and children who enjoy learning together through hands-on creation. In 2014, Robert and his daughters were commended by the Director of NASA for their robotic creations and invited to the White House by President Obama. In his speech to the nation, President Obama cited the Beatty family as a shining example of American entrepreneurial spirit. It’s fair to say, that on any given day, it’s likely that Robert, his wife Jennifer, and his daughters (now three!) will either be working on their latest Serafina / Willa novel, exploring Biltmore, hiking in the Great Smoky Mountains, or building their latest robot. It’s always a family affair. Robert had a long, close relationship with Narrative Magazine, where he served in a variety of roles, including Chief Technical Officer and Chairman of the Board. With a community of more than 150,000 avid readers, Narrative Magazine (www.narrativemagazine.com) is one of the leading literary voices in the country. It publishes Pulitzer Prize winners as well as talented emerging writers. Robert became involved with the editors of Narrative in 2005 in pursuit of his life-long goal of improving his writing craft. His relationship with the editors led to his involvement with the technical side of the magazine. He redesigned the website, set up a database-driven publication management system, formed the programming team, and became the magazine’s Chief Technical Officer. Over the years, he became heavily engaged with the business management of the magazine. He was asked to join the Board of Directors in 2009. He became Chairman of the Board in 2011. In 2013, he retired from his work at Narrative in order to focus more of his time on his writing. At your first opportunity, please go to and sign-up for www.narrativemagazine.com. It’s a wonderful source for literary stories, essays, poetry, photography, New Yorker-style cartoons, and much more. In addition to writing, Robert is interested in history, nature, birds, horseback riding, wildlife rehabilitation (he and his family are state-licensed wildlife rehabilitators), science, technology, computers, Jane Austen and other British and American carriage dramas, dogs, cats, architectural design, movies, and books of all kinds. In the past, Robert was a champion saber fencer and captain of his university fencing team, climbed mountains in New Zealand and the American West, and enjoyed the outdoors with his father and brothers. In the early days of his marriage to his wife, Jennifer, they enjoyed lure coursing their whippets and won the coveted AKC “Best in Field.” The wedding picture at right shows Robert and Jennifer with their wedding puppies.